This article is about islands of New Zealand. For islands elsewhere, see Chatham Island (disambiguation). The Chatham Islands from space. 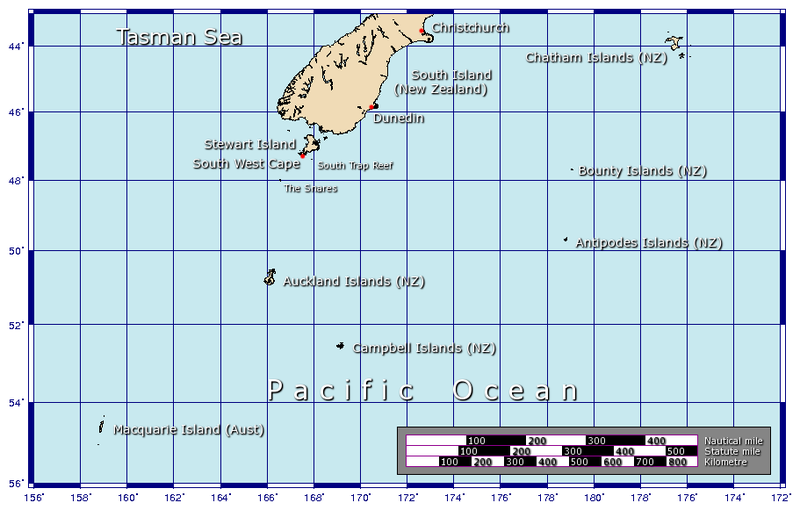 Chatham Island is the largest, Pitt Island is the second largest, and South East Island is the small island to the right of Pitt. The Chatham Islands form an archipelago in the Pacific Ocean about 680 kilometres (423 mi) southeast of mainland New Zealand. It consists of about ten islands within a 40-kilometre (25 mi) radius, the largest of which are Chatham Island and Pitt Island. The archipelago is called Rekohu ("misty sun") in the indigenous language Moriori, and Wharekauri in Māori. It has officially been part of New Zealand since 1842 and includes the country's easternmost point, the Forty-Fours. The islands are at about 43°53′S 176°31′W﻿ / ﻿-43.883, -176.517, roughly 840 kilometres (520 mi) east of Christchurch, New Zealand. The nearest mainland New Zealand point to the Chatham Islands is Cape Turnagain, in the North Island at a distance of 650 kilometres (400 mi). The nearest mainland New Zealand city to the islands is Hastings, New Zealand, located 697 kilometres (430 mi) to the North-West. The islands cover a total of 966 square kilometres (373 sq mi), almost all of which is on the two main islands. The islands sit on the Chatham Rise, a large, relatively shallowly submerged (no more than 1,000 metres or 3,281 ft deep at any point) part of the Zealandia continent that stretches east from near the South Island. The Chatham Islands, which emerged only within the last four million years, are the only part of the Chatham Rise showing above sea level. Chatham Island is the antipodes of the French department of Hérault (Languedoc-Roussillon). The islands are hilly with coasts being a varied mixture including cliffs and dunes, beaches, and lagoons. Pitt is more rugged than Chatham (Rekohu), although the highest point (299 metres or 981 ft)of Pitt is on a plateau near the southernmost point of the main island, which is dotted with numerous lakes and lagoons, notably the large Te Whanga Lagoon, as well as Huro and Rangitahi. Chatham has a number of streams, including Te Awainanga and Tuku. The climate is cold, wet, and windy with average high temperatures between 5 and 10 °C (41 and 50 °F) in July, the Southern Hemisphere winter. Chatham and Pitt are the only inhabited islands, with the remaining smaller islands being conservation reserves with restricted or prohibited access. The livelihoods of the inhabitants depend on agriculture, with the island being an exporter of coldwater crayfish, and increasing tourism. The Fort Unknown Mangere The Māori name has supplanted the English name for this island. Forty-Fours Motchuhar Motuhara the easternmost point of New Zealand, about 50 kilometres (31 mi) from Chatham Island. Chatham Islands have an oceanic climate characterised by a narrow temperature range and relatively frequent rainfall. Its isolated position far from any sizeable landmass renders the record temperature for main settlement Waitangi to be just 23.8 °C (74.8 °F). Massive phytoplankton bloom around the islands. The natural vegetation of the islands was a mixture of forest, scrubby heath, and swamp, but today most of the land is fern or pasture-covered, although there are some areas of dense forest and areas of peat bogs and other habitats. Of interest are the macrocarpa trees, with branches trailing almost horizontally in the lee of the wind. The ferns in the forest understory include Blechnum discolor. The islands are home to a rich bio-diversity including about fifty endemic plants adapted to the cold and the wind, such as Chatham Islands forget-me-not (Myosotidium hortensia), Chatham Islands sow-thistle (Embergeria grandifolia), rautini (Brachyglottis huntii), Chatham Islands kakaha (Astelia chathamica), soft speargrass (Aciphylla dieffenbachii), and Chatham Island akeake or Chatham Island tree daisy (Olearia traversiorum). The islands are a breeding ground for huge flocks of seabirds and are home to a number of endemic birds, some of which are seabirds and others which live on the islands. The best known species are the magenta petrel (IUCN classification CR]) and the black robin (IUCN classification EN), both of which came perilously close to extinction before drawing the attention of conservation efforts. Other endemic species are the Chatham oystercatcher, the Chatham gerygone, Chatham pigeon, Forbes' parakeet, the Chatham snipe and the shore plover. The endemic Chatham shag (IUCN classification CR), Pitt shag (IUCN classification EN) and the Chatham albatross (IUCN classification VU) are at risk of capture by a variety of fishing gear, including fishing lines, trawls, gillnets, and pots. For accounts and notes on seabird species seen in the Chathams between 1960 and 1993 onlnie. A number of species have gone extinct since European settlement, including the three endemic species of rails, the Chatham raven, and the Chatham fernbird. Also, a number of marine mammals are found in the waters of the Chathams, including New Zealand sea lions, leopard seals, and southern elephant seals. Much of the natural forest of these islands has been cleared for farming, but Mangere and Rangatira Islands are now preserved as nature reserves to conserve some of these unique flora and fauna. Another threat to wildlife comes from introduced species which prey on the indigenous birds and reptiles, whereas on Mangere and Rangatira, livestock has been removed and native wildlife is recovering. The plants cultivated by the Māori arrivals were ill-suited for the colder Chathams, so the Moriori lived as hunter-gatherers and fishermen. While their new environment deprived them of the resources with which to build ocean-going craft for long voyages, the Moriori invented what was known as the waka korari, a semi-submerged craft, constructed of flax and lined with air bladders from kelp. This craft was used to travel to the outer islands on 'birding' missions. The Moriori society was a peaceful society and bloodshed was outlawed by the chief Nunuku after generations of warfare. Arguments were solved by consensus or by duels rather than warfare, but at the first sign of bloodshed, the fight was over. The name "Chatham Islands" comes from the ship HMS Chatham of the Vancouver Expedition, whose captain William R. Broughton landed on 29 November 1791, claimed possession for Great Britain and named the islands after the First Lord of the Admiralty, John Pitt, 2nd Earl of Chatham. A relative of his, Thomas Pitt, was a member of the Vancouver Expedition. Sealers and whalers soon started hunting in the surrounding ocean with the islands as their base. It is estimated that 10 to 20 percent of the indigenous Moriori soon died from diseases introduced by foreigners. The sealing and whaling industries ceased activities about 1861, while fishing remained as a major economic activity. Chatham Islands date their anniversary on 29 November, and observe it 30 November. On 19 November 1835 and later on 5 December, about 900 Māori armed with guns, clubs and axes arrived on the brig Lord Rodney. The first mate of the ship had been kidnapped and threatened with death unless the captain took the invaders on board. The Māori included men, women and children, along with 78 tonnes of seed potato, 20 pigs and seven waka. The Māori came from two tribes, Ngāti Tama and Ngāti Mutunga. Initially they were cared for by the local Moriori. When it became clear they intended to stay the Moriori withdrew to their marae at te Awapatiki. The Moriori debated what to do about the Taranaki Māori invaders and decided to implement a policy of non-aggression. After this hui (consultation) the invaders began to takahi, or walk the land, to lay claim to it. They proceeded to ritually massacre about 300 Moriori, who are thought to have totaled about 2000, cannibalise the dead and enslaved the survivors. A Moriori survivor recalled: "[The Māori] commenced to kill us like sheep... [We] were terrified, fled to the bush, concealed ourselves in holes underground, and in any place to escape our enemies. It was of no avail; we were discovered and killed—men, women and children indiscriminately." A Māori conqueror said: "We took possession ... in accordance with our custom and we caught all the people. Not one escaped. Some ran away from us, these we killed, and others we killed — but what of that? It was in accordance with our custom." Ernst Dieffenbach, who visited the Chathams on a New Zealand Company ship in 1840, reported that the Moriori were the virtual slaves of Māori and were severely mistreated, with death being a blessing. By the time the slaves were released in 1862 only 160 remained, 10% of the 1835 population. After the invasion, Moriori were forbidden to marry Moriori, or to have children with each other. All became slaves of the invaders until the 1860s. Many died in despair. Many Moriori women had children by their Māori masters. A number of Moriori women eventually married either Māori or European men. Some were taken from the Chathams and never returned. In 1840 Ngāti Mutunga decided to attack Ngāti Tama at their pa. They built a high staging next to the pa so they could fire down on their former allies. Fighting was still in progress when the New Zealand Company ship Cuba arrived as part of a scheme to buy land for settlement. The Treaty of Waitangi, at that stage, did not apply to the islands. The company negotiated a truce between the two warring tribes. In 1841 the New Zealand Company had proposed to establish a German colony on the Chathams. The proposal was discussed by the directors and John Ward signed an agreement with Karl Sieveking of Hamburg on 12 September 1841. However, when the Colonial Office said that the islands were to be part of the colony of New Zealand and any Germans settling there would be treated as aliens, Joseph Somes claimed that Ward had been acting on his own initiative. The proposed leader John Beit and the expedition went to Nelson instead. The company was then able to purchase large areas of land at Whangaroa and Waitangi from Ngāti Mutanga and also large areas of land from Ngāti Tama. This did not stop Ngāti Mutunga from trying to get revenge for the death of one of their chiefs. They were satisfied after they killed the brother of a Ngāti Tama chief. The tribes agreed to an uneasy peace which was finally conformed in 1842. An all-male group of German Lutheran missionaries arrived in 1843. After a group of women were sent out to join them, three years later, several marriages ensued, and many members of the present-day population can trace their ancestry back to the missionary families. In 1865, the Māori leader Te Kooti was exiled on the Chatham Islands along with a large group of Māori rebels called the Hauhau, followers of Pai Mārire who had murdered missionaries and fought against government forces mainly on the East Coast of the North Island of New Zealand. The rebel prisoners were paid one shilling a day to work on sheep farms owned by the few European settlers. Sometimes they worked on road and track improvements. They were initially guarded by 26 guards, half of whom were Māori. They lived in whare along with their families. The prisoners helped build a redoubt of stone surrounded by a ditch and wall. Later, they built 3 stone prison cells. The Moriori community is organised as the Hokotehi Moriori Trust. The Moriori have received recognition from the Crown and the New Zealand government and some of their claims against those institutions for the generations of neglect and oppression have been accepted and acted on. Moriori are recognised as the original people of Rekohu. The Crown also recognised the Ngāti Mutunga Māori as having indigenous status in the Chathams by right of 160-odd years of occupation. The population of the islands is 650, including members of both ethnic groups. In January 2005, the Moriori celebrated the opening of the new Kopinga Marae (meeting house). Modern descendants of the 1835 Māori conquerors claimed a share in ancestral Māori fishing rights. This claim was granted. Now that the primordial population, the Moriori, have been recognised to be former Māori — over the objections of some of the Ngāti Mutunga —they too share in the ancestral Māori fishing rights. Both groups have been granted fishing quotas. Chatham and Pitt Islands are inhabited, with 600 residents in the 2013 Census. The town of Waitangi is the main settlement with some 200 residents. There are other villages such as Owenga, Te One and Kaingaroa, where there are two primary schools. A third school is on Pitt Island. There are also the fishing villages of Owenga and Port Hutt. The population is mainly of European, Māori and Moriori background; 59% said they identified as Māori (which includes Moriori), and around 77% identified as European or New Zealander. Waitangi facilities include a hospital with resident doctor, bank, several stores, and engineering and marine services. The main shipping wharf is located here. Visitors to the Chathams usually arrive by air from Auckland, Christchurch or Wellington (around 1.5 – 2 hours from Christchurch on a Convair 580) to the airport on Chatham Island. While freight generally arrives by ship (2 days sailing time), the sea journey takes too long for many passengers, and is not always available. The Chathams are part of New Zealand so there are no border controls or formalities on arrival, but visitors are advised to have prearranged their accommodation on the islands. Transport operators may refuse to carry passengers without accommodation bookings. There is no scheduled public transport but accommodation providers are normally able to arrange transport. Tasman Empire Airways Ltd (TEAL) initially serviced the Chathams by air using flying boats. With the withdrawal of TEAL, the RNZAF maintained an infrequent service with Short Sunderland flying boats. NZ4111 was damaged on takeoff from Te Whanga Lagoon on 4 November 1959 and remains as a wreck on the island. The last flight by RNZAF flying boats was on 22 March 1967. For many years Bristol Freighter aircraft served the islands, a slow and noisy freight aircraft converted for carrying passengers by installing a removable passenger compartment equipped with airline seats and a toilet in part of the cargo hold. The air service primarily served to ship out high-value export crayfish products. The grass landing field at Hapupu, at the northern end of the Island, proved a limiting factor, as few aircraft apart from the Bristol Freighter had both the range to fly to the islands and the ruggedness to land on the grass airstrip. Although other aircraft did use the landing field occasionally, they would often require repairs to fix damage resulting from the rough landing. Hapupu is also the site of the JM Barker (Hapupu) National Historic Reserve (one of only two in New Zealand) where there are momori rakau (Moriori tree carvings). In 1981, after many years of requests by locals and the imminent demise of the ageing Bristol Freighters, the construction of a sealed runway at Karewa, Tuuta Airport, allowed more modern aircraft to land safely. The Chathams' own airline, Air Chathams, now operates services to Auckland on Thursdays, Wellington on Mondays, Wednesdays and Fridays and Christchurch on Tuesdays. The timetable varies seasonally, but generally planes depart the Chathams around 10.30 am (Chathams Time) and arrive in the mainland around noon. There they refuel and reload, and depart again at around 1 pm back to the Chathams. Air Chathams operates twin turboprop Convair 580 aircraft in combi (freight and passenger) configurations and Fairchild Metroliners. Black Robin Freighters operates shipping services from Timaru. There is a small section of tar sealed road between Waitangi and Te One, but the majority of the islands' roads are gravel. Until the 1980s, the Chathams were in the Lyttelton electorate, but since then they have formed part of the Rongotai general electorate, which mostly lies in Wellington. Annette King is the MP for Rongotai. The Te Tai Tonga Māori seat (held since 2011 by Rino Tirikatene) includes the Chatham Islands. Local government on the islands, uniquely within New Zealand, involves a council established by its own Act of Parliament, the Chatham Islands Council Act 1995 (Statute No 041, Commenced: 1 November 1995). The Chatham Islands Council operates as a district council with regional council functions, making it in effect a unitary authority but with not quite as many responsibilities as the others. Some Regional Council functions are being administered by Environment Canterbury, the Canterbury Regional Council. In the 2010 local government elections, Chatham Islands had NZ's highest rate of returned votes, with 71.3 percent voting. Policing is carried out by a sole-charge constable appointed by the Wellington police district, who has often doubled as an official for many government departments, including court registrar (Department for Courts), customs officer (New Zealand Customs Service) and immigration officer (Department of Labour – New Zealand Immigration Service). A District Court judge sent from either the North Island or the South Island presides over court sittings, but urgent sittings may take place at the Wellington District Court. Because of the isolation and small population, some of the rules governing daily activities undergo a certain relaxation. For example, every transport service operated solely on Great Barrier Island, the Chatham Islands or Stewart Island/Rakiura need not comply with section 70C of the Transport Act 1962 (the requirements for drivers to maintain driving-hours logbooks). Drivers subject to section 70B must nevertheless keep record of their driving hours in some form. From 1 July 2015 the Canterbury District Health Board assumed responsibility from the Hawkes Bay District Health Board for providing publicly funded health services for the island. Three schools are located on the Chathams, at Kaingaroa, Te One, and Pitt Island. Pitt Island and Kaingaroa are staffed by sole charge principals, while Te One has three teachers and a principal. These schools cater for children from year 1 to 8. No secondary school is present on the Chathams. The majority of secondary school-aged students leave the island for boarding schools in mainland New Zealand. A small number remain on the island and carry out their secondary education through correspondence. Most of the Chatham Island economy is based on fishing and crayfishing, with only a fragment of in adventure tourism. This economic mix has been stable for the past 50 years, as little infrastructure or population is present to engage in higher levels of industrial or telecommunications activity. Air Chathams has its head office in Te One. At present, two 200-kW wind turbines provide most of the power on the island, while diesel generators provide the rest. In Jules Verne's Robur the Conqueror, Robur anchors his flying vessel Albatross over the Chathams after the horizontal propellers are damaged in a storm. The novel Cloud Atlas and its 2012 film adaptation includes the diary of a fictitious 19th century American traveller who passes through the Chathams. In Joe Buff's futuristic nuclear submarine warfare novel Crush Depth (ISBN 0-06-000964-0), Chatham Island is destroyed by an Axis-planted atomic bomb. The TVNZ series How the Other Half Lives (2008) had a segment on the Chatham Islands. Country Calendar TVNZ program, Hunting Aotearoa Māori Channel, "What Now" children's television. Residents of the Chatham Islands were the subject of an episode of TVNZ's "This Town" on November 9, 2013. ^ McGlone, Matt (21 September 2007). "Ecoregions: The Chatham Islands". Te Ara – the Encyclopedia of New Zealand. http://www.teara.govt.nz/TheBush/UnderstandingTheNaturalWorld/Ecoregions/9/en. Retrieved 2009-02-08. ^ "Waitangi, Northland, New Zealand Climate Summary". Weatherbase. http://www.weatherbase.com/weather/weather-summary.php3?s=939870&cityname=Waitangi%2C+Northland%2C+New+Zealand&units=. Retrieved 11 January 2015. ^ "Waitangi, Northland, New Zealand Temperature Averages". Weatherbase. http://www.weatherbase.com/weather/weatherall.php3?s=939870&cityname=Waitangi%2C+Northland%2C+New+Zealand&units=. Retrieved 11 January 2015. ^ "Climate Data and Activities". NIWA Science. http://www.niwa.co.nz/education-and-training/schools/resources/climate. Retrieved October 15, 2013. ^ "Chatham Shag (Phalacrocorax onslowi) - BirdLife species factsheet". Birdlife.org. http://www.birdlife.org/datazone/speciesfactsheet.php?id=3691. Retrieved 2015-08-27. ^ "Pitt Shag (Phalacrocorax featherstoni) - BirdLife species factsheet". Birdlife.org. http://www.birdlife.org/datazone/speciesfactsheet.php?id=3700. Retrieved 2015-08-27. ^ "Chatham Albatross (Thalassarche eremita) - BirdLife species factsheet". Birdlife.org. 2010-12-02. http://www.birdlife.org/datazone/speciesfactsheet.php?id=3963. Retrieved 2015-08-27. ^ Rowe, S (August 2010). "Level 1 Risk Assessment for Incidental Seabird Mortality Associated with New Zealand Fisheries in the NZ-EEZ". http://www.doc.govt.nz/Documents/conservation/marine-and-coastal/marine-conservation-services/level1-seabird-risk-assessment.pdf. ^ "Seabirds Recorded at the Chatham Islands, 1960 to May 1993" (PDF). Notornis.osnz.org.nz. http://notornis.osnz.org.nz/system/files/Notornis_41_sup_97.pdf. Retrieved 2015-08-27. ^ a b c King, M. (2004). Being Pakeha. Penguin. p 196. ^ Patricia Burns (1989). Fatal Success: A History of the New Zealand Company. Heinemann Reed. pp. 243, 244. ISBN 0-7900-0011-3. ^ "Getting to the Chatham Island". Discoverthechathamislands.co.nz. http://www.discoverthechathamislands.co.nz/visit/Getting-around/. Retrieved 2015-08-27. ^ "Home - Chatham Islands Shipping Ltd". Chathamislandsshipping.co.nz. http://www.chathamislandsshipping.co.nz/. Retrieved 2015-08-27. ^ www.seawings.co.uk, flying boat forum. "Short flying boats in New Zealand". http://theflyingboatforum.forumlaunch.net/viewtopic.php?f=62&t=985&start=50. Retrieved 3 June 2013. ^ Stewart, Ashleigh (25 July 2015). "Ministry of Health 'concerned about financial performance' of CDHB". The Press. http://www.stuff.co.nz/the-press/news/69641932/Ministry-of-Health-concerned-about-financial-performance-of-CDHB. "As of July 1, control of the Chatham Islands' health services will transfer to Canterbury." ^ "Contact Us". Airchathams.co.nz. http://www.airchathams.co.nz/contact-us.html. Retrieved 2015-08-27. Clark, Ross. 1994. Moriori and Māori: The Linguistic Evidence. In Sutton, Douglas G., ed., The Origins of the First New Zealanders. Auckland: Auckland University Press. Davis, Denise and Solomon, Māui. 2006. Moriori. In Te Ara – the Encyclopedia of New Zealand, updated 9 June 2006. Howe, Kerry R. 2006. Ideas of Māori origins. In Te Ara – the Encyclopedia of New Zealand, updated 9 June 2006. King, Michael (1989). Moriori: A People Rediscovered (2000 ed.). Viking. ISBN 0-14-010391-0. McFadgen, B. G. (March 1994). "Archaeology and Holocene sand dune stratigraphy on Chatham Island". Journal of the Royal Society of New Zealand 24 (1): 17–44. DOI:10.1080/03014223.1994.9517454. Retrieved on 2007-08-21. Harper, Paul (15 October 2010). "Voter turnout up in local elections". The New Zealand Herald. http://www.nzherald.co.nz/nz/news/article.cfm?c_id=1&objectid=10680766. Retrieved 16 October 2010. Waitangi Tribunal. 2001. Rekohu: A Report on Moriori and Ngati Mutunga Claims in the Chatham Islands. Report No. 64. New Zealand (2008). Chatham Islands: Heritage and Conservation (Rev. and enl. ed.). Christchurch, N.Z: Canterbury University Press in association with the Dept. of Conservation. ISBN 978-1-877257-78-0. Rekohu: The Chatham Islands Education Resources. This page uses content from the English language Wikipedia. The original content was at Chatham Islands. The list of authors can be seen in the page history. As with this Familypedia wiki, the content of Wikipedia is available under the Creative Commons License.